Is this the second coming for solid state storage? A marker in the sand for all the NVMe SSDs set to follow it. Intel's SSD might be a tough act to follow. Wipe the slate clean. That's the thinking behind the Intel SSD 750 Series 1.2TB. Forget the SATA interface, forget the AHCI protocol. This is high bandwidth, NAND Flash-specific storage of the highest order. This is solid state all grown up and with Non-Volatile Media Express (NVMe), and it's forging its own path free of the past. Since the first consumer SSDs started hitting our PCs they've all been piggy-backing old school, high-latency mechanical drive technology in terms of their interfaces and protocols. In the beginning of the SSD revolution running across the 600MB/s limit of the SATA 6Gbps interface wasn't much of a problem. Quickly our SSDs became more trustworthy and more capable, and suddenly they were bumping their heads against the limits of the suddenly geriatric-looking connection. 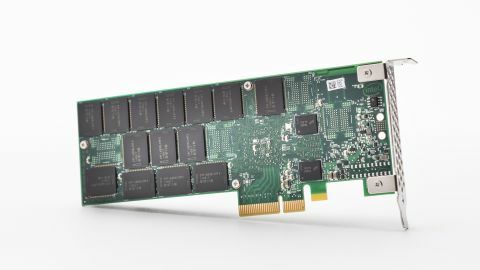 Along came PCIe-based drives, though they were mostly still just groups of smaller SATA drives connected to a PCIe RAID controller. Then recently came actual, proper, honest-to-goodness PCIe interfaces specifically designed for SSDs, and the new wave of Flash storage had begun. The M.2 socket and the still mostly unused SATA Express arrived with the Intel Z97 and X99 chipsets. But breaking clear of the bandwidth limitations of the SATA interface is only one strand in unlocking the true potential of solid state storage. The other is about getting around the legacy setup all previous SSDs have been tied to. The old Advanced Host Controller Interface (AHCI) protocol was introduced when SSDs where a mere twinkle in an old USB stick's eye, and has been almost inextricably linked to high latency spinning platters. That setup still works fine for mechanical storage drives, but the legacy commands in AHCI still have to be run through, even when an SSD is in place. The drive then has to go through each legacy command even if they have no relevance to high-speed SSDs. And that wastes an awful lot of CPU cycles. This is where the NVMe protocol steps in, designed specifically for Flash memory without all the legacy hoops in place for the ol' spinning platters.